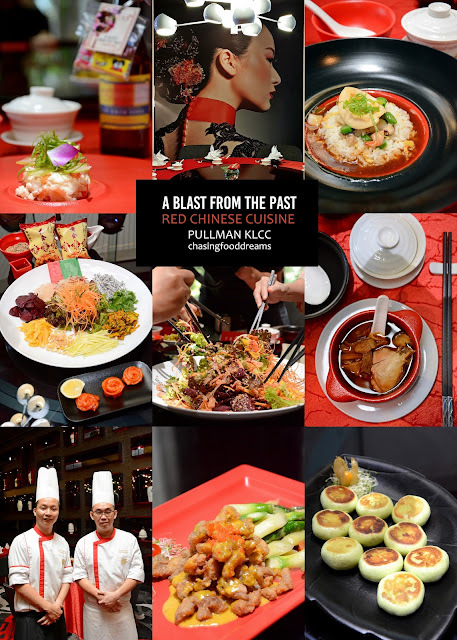 Painting the town red, Pullman Kuala Lumpur City Centre Hotel & Residences is celebrating the spring of the Lunar New Year with a Blast From The Past at RED Chinese Cuisine. 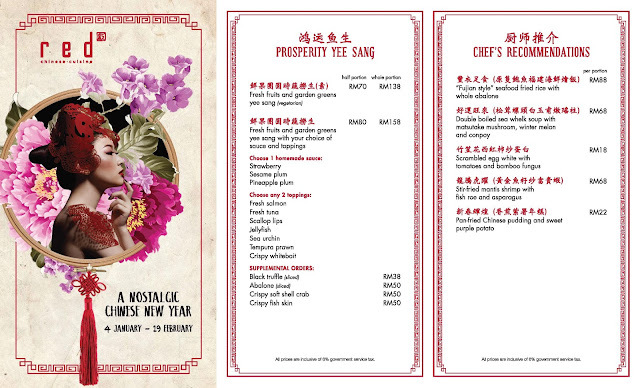 From 4 January to 19 February 2019, its all about a nostalgic celebration dining promotion at the gorgeous RED Chinese Cuisine. Whether it be a simple reunion with family and friends or a big bang celebration with good company, its all about carrying on timeless cultural traditions together with everyone. 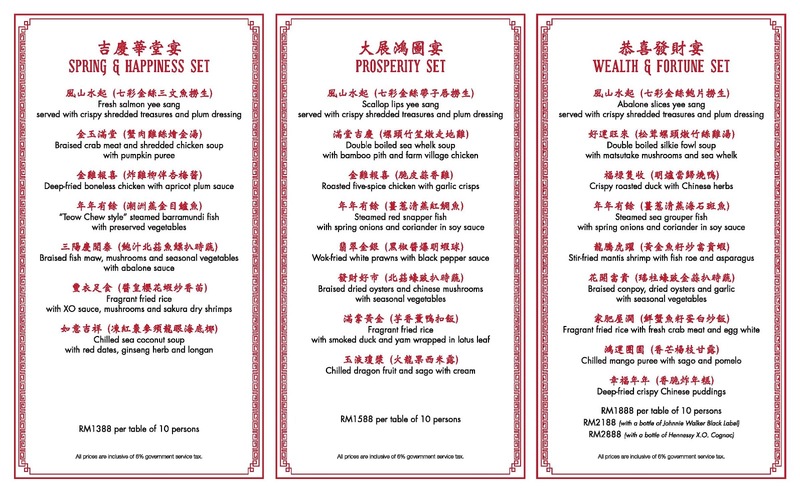 A feast is always in order and Chinese Head Chef Mak Kar Leong along with the culinary team at RED has curated 3 festive 8-course Auspicious Set Menus along with Festive Signature A la Carte Menu and Yee Sang Menu for this seasonal celebration. RED is bold, classy and chic. From the moment one walks in, the ambiance at RED commands their full attention. The main entrance of the restaurant captivates diners with this beautiful scene. 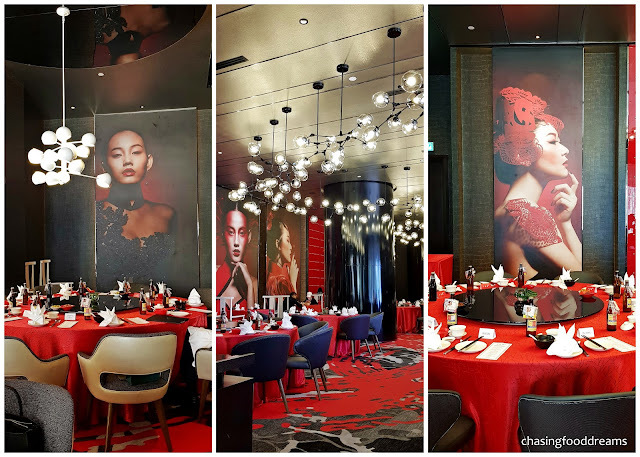 If the splashes of bright red and black contrasting theme is not enough to make one in awe, the large wall photos of sultry and elegant ladies dressed in oriental theme will do so. The spacious main dining area is further enhanced by modern mixes of contemporary lightings along with art pieces and oriental ornaments. The chic RED also has four exclusive VIP dining rooms for private dining. 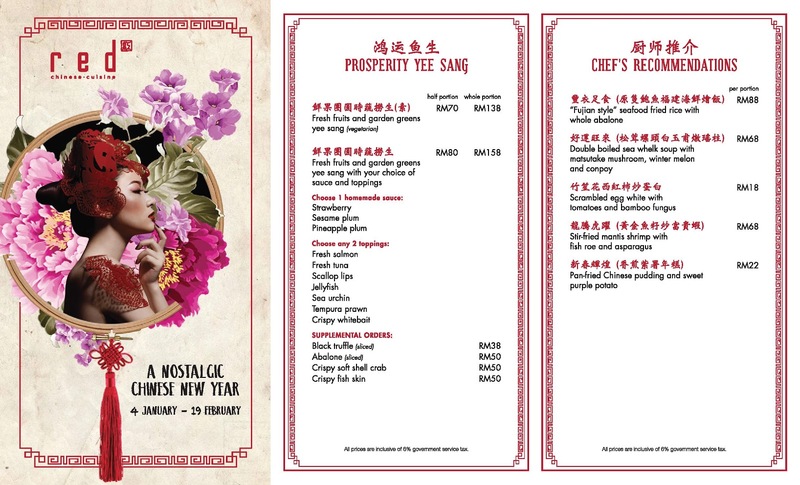 A Blast from the Past take diners back to their yesteryears when Malaysian childhood memories are made of trips to ‘Kedai Runcit’ after school to enjoy a bottle of soda or a sweet treat candy treat of hawflakes, chewing gum and more. Raffle tickets were the game that children would play and the pleasurable luck of winning a toy would make every kid smile with joy. RED hopes to make their diners reminisce such beautiful memories while dining in today’s modern era. Diners can tuck into their choices of yee sang but the all-time-favorite these days are salmon yee sang. 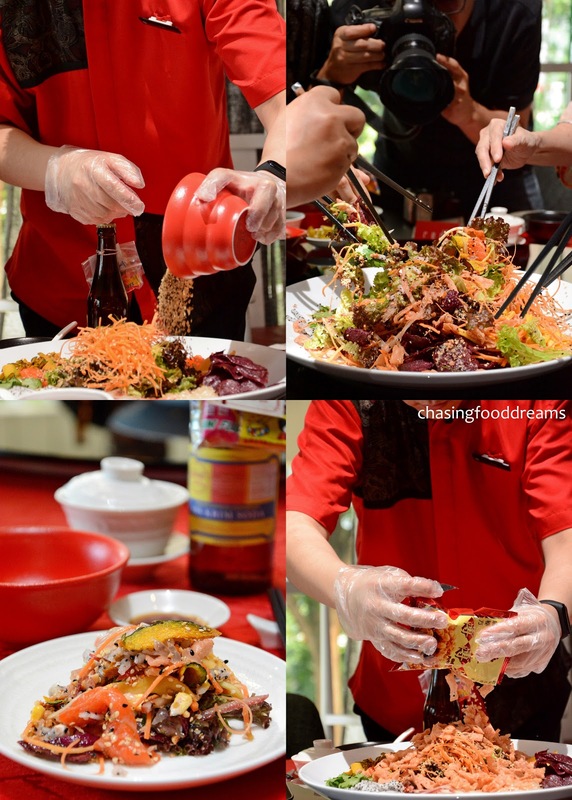 RED features their signature Prosperity Salmon Yee Sang with Crispy Shredded Treasures & Plum Dressing. Chef Mak strives on creating healthy dishes hence his yee sang comprises of fresh greens and fruits as well as crispy baked root vegetables. There are also fresh slivers of dragonfruit, mango, jackfruit, pomelo and corn. The addition of the crunchy baked pumpkin and purple sweet potato is a brilliant one as it gives the yee sang amazing crunch factor. Tossing for a good year to come, this mandatory tradition never fails to bring joy to everyone! The Salmon Yee Sang is delicious. Expect lots of sweet and tang of flavours along with addictive crunch factor. As there are lots of crisp and fresh greens and fruits, the yee sang is easily enjoyable. For the soup course, the Double Boiled Sea Whelk Soup with Matsutake Mushroom, Winter Melon & Conpoy is perfect to warm up the tummy and sooth the soul. A rich amber clear broth along with tender chicken, lightly chewy sea whelk, premium matsutake mushrooms, bamboo pith, dried scallop and winter melon made this soup utterly satisfying and delicious. The next signature dish of Stir-Fried Mantis Shrimp with Fish Roe & Asparagus is bound to be a crowd favorite. Crispy battered mantis shrimp coated with the unctuous salted egg yolk sauce and crowned with fish roes has a tasty moreish note. The side of asparagus balances the richness of the mantis shrimp well. The simplicity of Scrambled Egg White with Tomatoes & Bamboo Fungus showed the culinary skills of the chef at RED. The fluffy egg white has such delicate notes and is well-enhanced by the sweet and sourish tang of juicy tomatoes while the bamboo fungus added a crunchy note to the dish. Clean and delicate flavours made the dish a true testament of timeless classic made well. To end the festive meal, the Pan-Fried Chinese Pudding & Sweet Purple Potato makes a delightful change of the usual Chinese desserts. Nian gao and mashed sweet potato filling is nicely enveloped on pandan dough, steamed and pan seared prior to serving. There is a lovely crispness while the inside remains fluffy with the creamy filling. Dim Sum Chef Jeffrey Kwan demonstrated on how to make his signature Pan-Fried Chinese Pudding & Sweet Purple Potato. Looks relatively easy but it still requires effort and time to make this delectable Chinese dessert. Available for lunch and dinner. Vegetarian dishes are also available.